Master's European lecture tour was nearing an end, and the highly energized working teams had become experts in the many aspects of lecture promotion. The first thing that amazed the local people was that fellow initiates who had come from around the world to work with devoted cooperation could distribute tens of thousands of flyers and put up numerous posters around the city in just a few hours' time. Overnight, Master's photos could be seen almost everywhere around Dublin. On the morning of the lecture, the selected venue, the Royal Dublin Society grounds, looked like its normal self. However, by the afternoon, fellow initiates had given it a completely new appearance. They employed all kinds of skills, ranging from artistic design and lighting to other decorative artwork in rearranging things and making new installations. Certain spots were selected for the display of Master's paintings, publications, lamps, Celestial Jewelry and Celestial Clothes. As the time of the lecture approached, more and more people came despite persistent thunder and rain. At about half past three, the weather turned fine and the guests grew in numbers. The venue was fully packed. A videotape was played in the lecture hall showing the many generations of dazzling Celestial Jewelry and amply demonstrating the fabulous artistic talent of an enlightened person. There was a sensational stir in the venue when Master arrived wearing a long, blue gown and white cape. 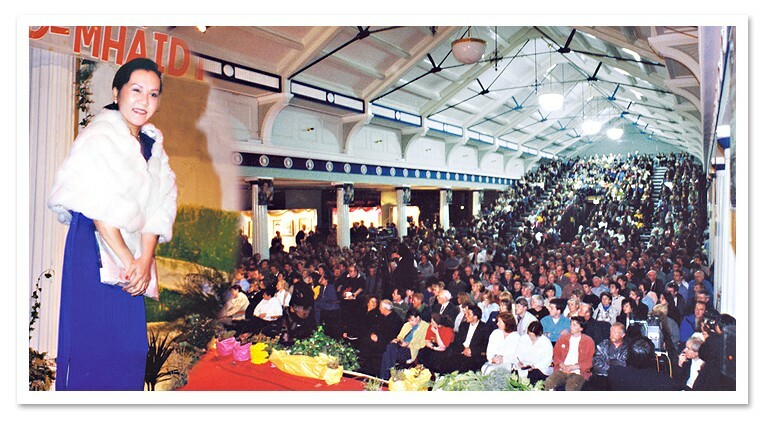 The audience listened attentively to Her discourse, and a positive atmosphere graced the venue. We could feel the presence of many Truth-seekers in this country who were looking forward to the last leg of the journey back to the Kingdom of God. We are sure that the number of Irish initiates will grow rapidly in the near future.